TCAN is configured as an intimate listening room, with no seats located further than ten rows from the stage. Seating for most events is reserved. The seats located to the right of the stage are not released until the main sections are nearly full. The primary performance space is roughly 3,000 square feet in size and has seating for 270 patrons. A concession stand is located in the lobby, serving an assortment of snacks and soft drinks at most performances. TCAN offers beer and wine service at all feature performances to patrons with acceptable ID. Accessible seating is available online or through the TCAN Box Office for patrons requiring special accommodations. 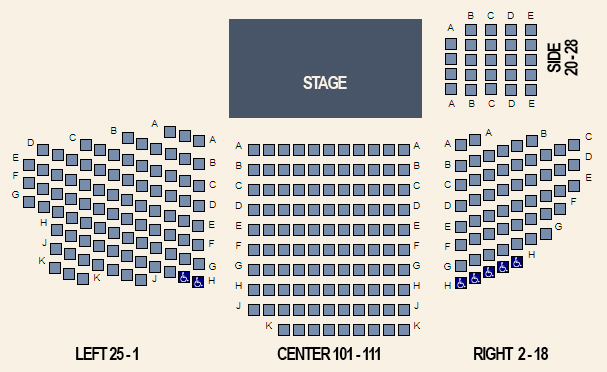 The seating plan below is used for most concert performances, with all seats reserved.